Last fall, we posted an article that was meant to help you determine Which Shelving is Best for You. While there are situations that call for the versatility of Wire Shelving or the solid structure of Clipper Shelving, the majority of businesses will find that Rivet Shelving offers the most long-term benefits. 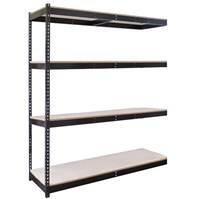 If you are not familiar with it, Rivet Shelving is a steel shelving system that utilizes boltless assembly for a quick set up and easy organization. Each shelf is made of steel beams with factory attached rivets that fit into slots along the post. When tapping the beams into place with a rubber mallet, you are actually reinforcing the rigidity of the shelf! 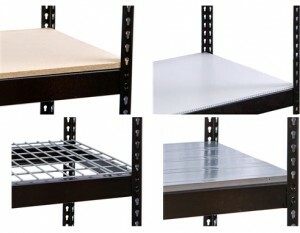 One of the greatest features of Rivet Shelving is that it is completely modular, available as Starter and Adder units. Thanks to this clever design, you can expand Rivet shelving one section at a time. As your business grows, your storage needs evolve, meaning that you would have to restructure your shelving system to keep everything organized. However, with steel Rivet Shelving, your Starter unit becomes an investment that pays you back over time with bountiful storage space. Whether you move into a new space or add onto your building with new construction, you can attach Adder Rivet Shelving to create a continuous run of organized space. Depending on your particular storage application, you can take advantage of the different styles of rivet shelving to help you get organized. 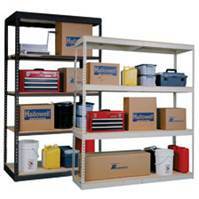 Use Single Rivet Shelving to create an area for high density storage. Single rivet shelving utilizes smaller, low-profile beams to create the shelf frame, allowing you to maximize the vertical space between each level. 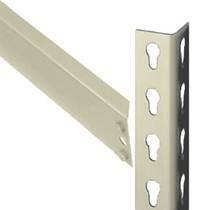 Single Rivet Shelves are ideal for loose products, small components, and open front storage bins. 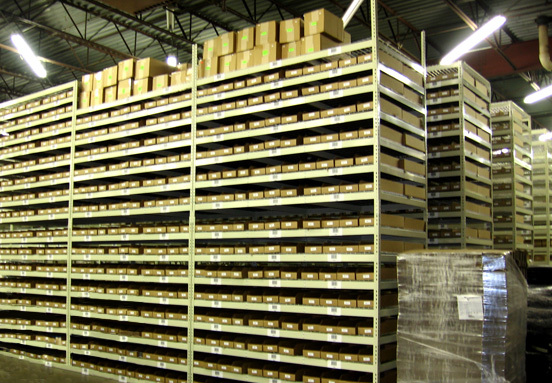 Allocating a space for small parts in your stock room can also increase your efficiency by better utilizing space, sending employees to one area for similar parts rather than a on a snipe hunt. 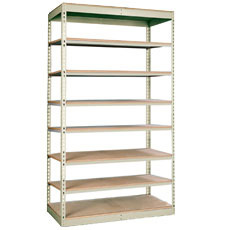 Of course, Adder units are available to extend the length of these shelves at any time. On the other end of the spectrum is Double Rivet Shelving, which is better for bulk storage. Each cross beam of the Double Rivet shelf frame is made of roll-formed steel that has been bent for added strength. These angle beams are bolstered with center-supports for increased weight capacity. Not only will these steel shelves allow you to organize heavy/over-sized items, they can also help you re-organize your stock room. Using a Starter kit in combination with sections of Adder units, you can create aisles of steel shelving that make up the bulk of your warehouse. This is the perfect storage solution for inventory that is hand-loaded! Double Rivet Shelving also provides the benefit of optional decking that is specifically tailored to your storage needs. While the steel frame of each shelf is supportive in and of itself, the style of deck that you choose can help you meet certain criteria. For example, the particle board Wood Decking is applicable for almost any storage solution, but only the corrugated Featherdeck will accommodate chemical spills and resist water. Maybe your building has to meet certain fire-safety standards, or you require better ventilation. In that case, the 2″ x 4″ grid of Wire Decking will meet your needs. Finally, there is the exclusive EZ-Deck metal decking, which can save you money on shipping and is easy to install by hand. These decks are made of 6″d metal planks that have been galvanized for added resistance and can be set into place one at a time. In short, when you buy Rivet Shelving, you are making a smart investment in a reliable storage system that can be customized for your needs. If you have any questions about Rivet Shelving, or are interested in working with an expert that can design a storage solution for you, call Shelving Inc. at 1.800.637.9508. We’re available Monday through Friday, 8:30 am to 5:30 pm EST to get you organized. Efficiency, productivity are the key factors which reflects proportionally on the industry’s growth. These points will certainly help to attain that growth. Visit https://www.giraffestorage.com/ for more insight.